NEPG is looking for a cover model for our facebook page for the rest of the summer. Any and all pet owners are encouraged to enter you do not have to live in New England for this contest. Go to facebook.com/newenglandpetguide and upload your pets photo. Sunday July 15th the photo with the most likes wins. Pet will them be our facebook cover pic for the rest of the summer. Pet and pet owner will also receive a little gift from NEPG. Hurry time is running out. “Maddison is Lily’s guide dog. If they are out and about, for the majority of the time Maddison will lead and Lily will walk nearly touching her so she knows where to go. It’s lovely to watch. Maddison is always looking out for her. 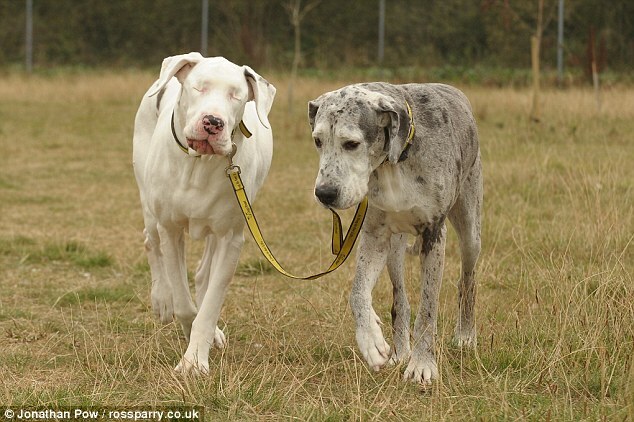 London, England – The Daily Mail reports another happy ending for a special needs blind Great Dane and the canine partner who has become her “seeing eye” companion. Lily and Maddison have been adopted by the Williams family and will live the charmed lives they so deserve. Lily, six-years-old suffers from an eye disease that caused her eyelashes to grow into her eyeballs causing extensive corneal damage leaving her blind. Maddison, seven-years-old bonded with Lily, and together the dogs go everywhere. This past summer their owner gave them up because they were too much work. They have been living at the Dogs Trust in Shrewsbury, and the shelter was having a hard time finding new homes for the dogs. When the Trust decided to advertise for a home for the dogs, the heartwarming story of the two dogs went viral. The Daily Mail reported 2000 responses to their article from people inquiring about adopting the dogs. The Trust reported hundreds of inquiries.